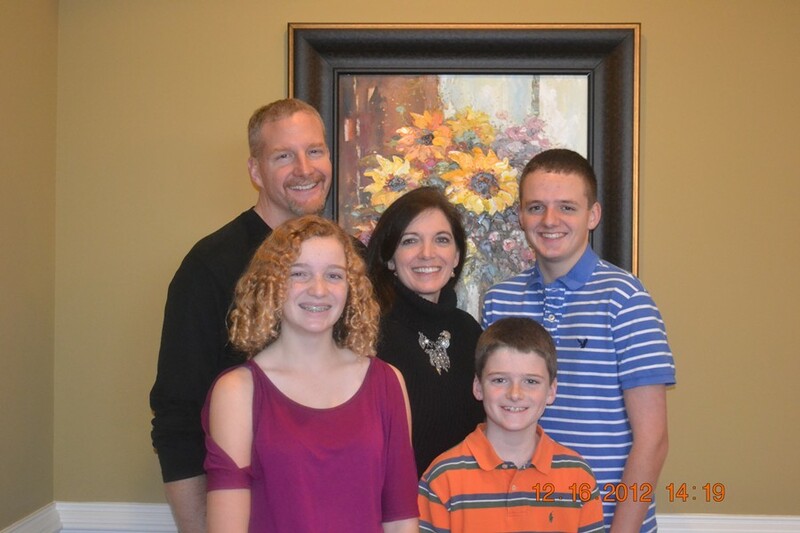 the 2013 "TENNIS FAMILY OF THE YEAR"
JWTTA would like to congratulate David, Janice, Edward, Elise, and Michael Sickle on being awarded the 2013 Tennis Family of the Year at the recent USTA Tennessee Tennis Convention. This award is given to the family that best promotes tennis in Tennessee. The Sickle family certainly fits that definition. We are proud to have members of the JWTTA recognized by the Tennseee tennis community! The family has lived in Jackson for six years. David is an orthopedic surgeon with a great reputation. David is the volunteer team physician at JCM and is almost always present for all home games. The children are all active in community service including special needs athletics. Before going to Med School David was a member of the Knoxville Symphony (1990-95) and is an accomplished bassist (he was assistant principal bassist). His son, Edward, is also very involved in music (drum and guitar). Elise plays the harp. Michael plays piano and bass guitar. Janice is the glue that keeps them all going in various directions and has been the driving force in their Home School endeavors. The entire family is very active in Fellowship Church. They are admired by many just for the good work they do in many areas outside of tennis. David - Team tennis - 2009 USTA League Adult - Jackson, TN - 4.5 Men; 2010 USTA Tri-Level League Adult - Jackson - 3.5/4.0/4.5; Adult Men/ 2011 USTA League Adult - Nashville - 4.5 Adult Menl; 2012 USTA League Adult-Memphis - 4.5 Men. Tournaments - Alex Wellford Classic, Southern Adult Indoor Open, and The Memphis Cup II. David started playing in high school and plays recreational tennis at least 4 times a week as well as weekly lessons with our local pro. Currenty ranked 3 in TN in Mens 45, 64 in Southern, 3 in Mixed 45 Doubles in TN, and 17 in Southern with wife, Janice. Janice - Team tennis - played on Memphis 4.0 team for last 4 years. Tournaments - Alex Wellford Classic and The Memphis Cup. Janice played for Alliance High School in Alliance Ohio in 1984 and 1985. She also played in college for Malone College and went to Nationals in Kansas City in 1986/87 school year. Janice also takes weekly lessons with local pro and plays recreational tennis at least 4 times weekly with friends or family. Currently ranked with husband, David, 3 in TN in mixed 45 doubles and 17 in Southern. Edward- Takes weekly lessons with local pro, plays in local tennis academy at least 3 hours weekly, teaches tennis 3 days a week in after school programs, strings racquets for local pro, and plays in many junior tournaments. Currently ranked 173 in boys 16s. Michael - Takes weekly lessons with local pro, plays in local tennis academy at least 2 hours weekly, plays in many junior tournaments - currently playing Quick - Start. Michael is urrently ranked 36 in Boys 10s.